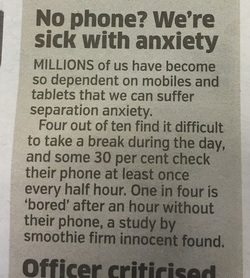 Add Video here proposing a challenge to our community after reading this article in Metro Tuesday May 10th 2016 to set a timer alarm during 'day light hours' for 2 hours and within this time period you are NOT allowed to use your phone during this time other than taking phone calls. This means No Social media, No YouTube, No net browsing. One ideal tip here is to really forget about your phone so move it out of site and place it on a soft surface so it does not vibrate and distract you etc etc. When your alarm goes off you may conintnue with your life as normal, BUT would ask you to post a message here how you felt, what did you do in your 2 hours? Did you learn anything and could you do this again?